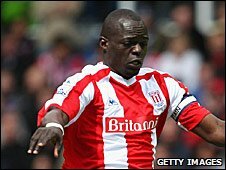 Stoke City defender Abdoulaye Faye said he was shocked but proud to be voted player of the year by all of the club's supporters groups. Faye, a £2.25m signing from Newcastle in August, only missed two games in the Potters debut Premier League season. "I'm very proud because I have so many trophies, I don't believe it," he told BBC Radio Stoke. "Everyone thought Stoke City would not stay in the Premier League, and we've proved everyone wrong." The 31-year-old added: "I would love to stay (for the rest of my career). I'm very happy here and I have everything. The supporters love me, and the manager is very good. I hope to stay here because I love Stoke City." Faye has become something of a cult hero with the Stoke fans, and has forged a strong defensive partnership with Ryan Shawcross in the second half of the season, as well as captaining the team since the turn of the year. The Potters' 2-0 win over Wigan at the Britannia Stadium on Saturday means they could finish in the top half of the Premier League if they win against Arsenal on the final day of the season, and Faye is keen to push the club forward. "Next season we want to prove ourselves again, because the Premier League is not easy," added the Senegal international. "I think we need two or three more experienced players and then we will do even better. "Arsenal are a big team in the Premier League. They play very good football. But they don't like physical play, and I'm confident in our team." Stoke beat the Gunners 2-1 at home in November, in a match remembered for the post-match comments of Arsenal manager Arsene Wenger, who accused Stoke of being over-physical.